Like all of the Olympus E-series, with the E-600 you're getting a DSLR that anyone could carry comfortably around with them all day, taking shots as and when they present themselves. Thus, as with the Micro Four Thirds cameras that the original Four Thirds system models now find themselves competing with, the E-600 suggests itself as an excellent tool for the travel or street photographer. Not only that, but if camera and basic kit lens can be picked up for a penny shy of £400, as advertised, it won't bite a huge chunk out of your holiday expenditure either. That was still a good £100 cheaper than we could alternatively find an E-620 with the same lens at the time of writing. OK, you don't get the latest must haves such as HD video capture, nor a weather sealed body, but in truth it would be a welcome surprise to find them included at this price point. Omitted here, in comparison with the E-620 are illuminated buttons, three Art Filters in Grainy Film, Pale and Light Colour, Light tone, plus the E-620's multiple exposure and multi aspect ratio shooting options, the former overlaying up to three images to produce a single image, and the latter adding cinematic 16:9 framing to the standard 4:3 ratio. Arguably though nice to have, none of these is essential for those trading up to their first DSLR, so won't be missed by those who haven't previously experienced them on models elsewhere in the Olympus range. 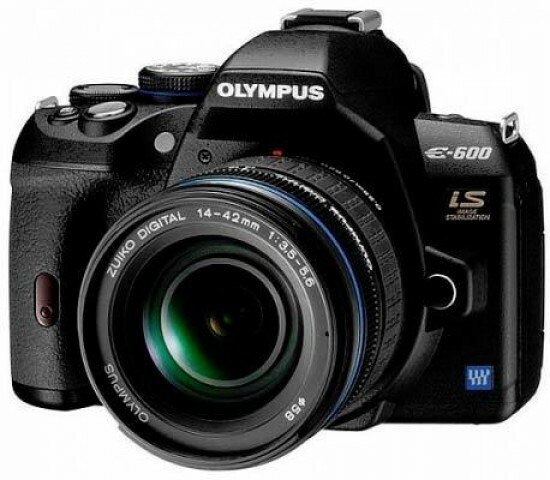 OK so it's not the E-620 'proper', but, to summarise, since you're basically getting a user-friendly mid-range camera for an entry-level price, there's little about the Olympus E-600 that can be faulted.